Singular subject takes a singular verb, and a plural subject takes a plural verb. 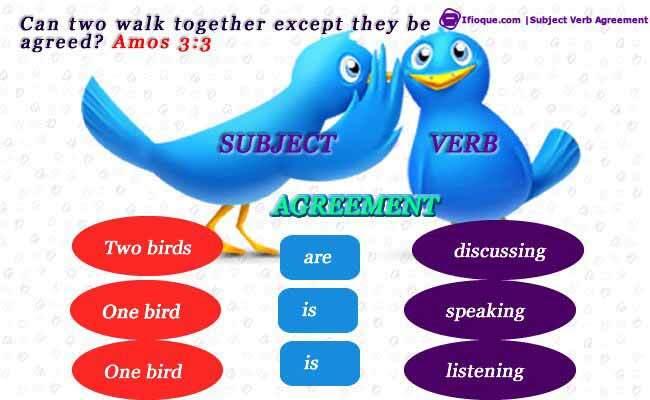 Subject-Verb Agreement is a fancy term for an idea that seems simple enough: the subject and the verb must walk together—meaning a singular subject takes a singular verb, and a plural subject takes a plural verb. But the problem is, not all subjects clearly proclaim themselves to be singular or plural, and in many cases the plain grammatical form of the subject conflicts with our sense of the intended meaning. For this reason grammarians have introduced the mechanism of s–endings, used in determining the condition of the subject and thus supplying the appropriate verb. To adhere to the rules of subject-verb agreement, you must understand the concept of s–endings; for the rules guiding subject-verb agreement are all based on the use of S-endings. You must note and not get confused between singular and plural verbs, because not all words ending in –s are plural. The –s has several other uses, depending on the kind of word it’s being tagged to. In the examples above, many learners might think ‘writes’ as a plural verb and ‘write’ as a singular verb. A. The Natural S — Several words in English have an S as their final letter. Meanwhile, these S’s are not endings. They only make part of the basic spelling of the word. For example, kiss, bus, miss, Paris, etc., all end in s the way other words may end in t or n or r, etc. By adding an –s ending, we now increase our object from one to more than one. 2. When the letter before the –y is a vowel; an s is added. In the first sentence, the verb is has, the subject is John. Therefore, John is used as a noun. In the second sentence, however, the verb is is, and the subject is bicycle. The word John’s is describing the word bicycle. This simply means that by adding the ’s, we converted an ordinary noun into an adjective. By virtue of these demonstrations (we have observed), the difference between the Noun S and the Possessive S is the use of a punctuation mark, which is known as an apostropheOpens in new window. D.	The Verb S — The Verb S–ending is a rather tricky one. It is reverse of the way we generally think of s–endings. First and foremost, it is added to Verbs, not nouns. Secondly, it makes a verb becomes singular. Note that this means that between a verb and its subject there is just only one S–ending to go around. Either there is an S on the verb, or there is an S on the subject. The boss cajoles his employees. The bosses cajole their employees. Although the basic rules of subject–verb agreement are fairly straightforward, there are situations in which the rules are not easy to apply. Sometimes, scanning through the words in search of an s–ending on the subject to decide whether the verb needs an s–ending will prove futile because there are a few exceptions. 1. The Verb To Be — The Verb To be is irregular, and it presents special problems in subject–verb agreement. Because it is irregular, we can’t just addd an S–ending or not. The S–forms are completely different words (as in the case of is and are). One typewriter is not enough. One typewriter was not enough. Using am when the subject is I tends to bring up a high–point about Subject–Verb Agreement. But what happens to the verb when its subject is a pronoun? Since pronouns don’t get s–endings to make them plural, and since some pronouns (like you) can be used as either singular or plural, the rules we’ve learned so far won’t help us when a pronoun is the subject of a present tense verb. He travels on business quite often. They travel on business occasionally. This means, the whole subject consists of two nouns connected by the word and. When it comes to subject–verb agreement, compound subjects (nouns connected by and) are considered plural. That means their present tense verbs do not take s–endings; that is, they take plural verbs. The accountant and her two assistants work hard. The forklifts and conveyor need repair. All sales representatives and their families are invited to the company picnic. Looking at the above examples, the fact is, these s–endings are just an extra clue. The and alone tells us not to put an s–ending on the verb. 4. Compound Subjects Connected by Or and Nor — When the nouns in a subject are connected by or, the rules change dramatically. My secretary or my assistant screens my calls. My secretaries or my assistant screens my calls. My secretary or my assistants screen my calls. My secretaries or my assistants screen my calls. Can you sight the pattern? Notice the word secretary has no effect on the verb; whether it has an s–ending or not doesn’t really matter. The word assistant is what counts here. When assistant has no s– ending (the first two examples), the verb gets an s–ending. When assistants is used with an s–ending (the second two examples), the verb gets no s–ending. This is because assistant is the noun closest to the verb. Either your software or our drivers are not updated. Neither I nor my partner recalls your order. Note also that when the subject concerns a space of time, a sum of money, a measurement, weight, volume, or fraction, we usually use a verb with an s–ending. Two years in a military camp seems like eternity. These last four years have been filled with adventure. One half of the class was absent. (An s–ending verb is used here because the subject is thought of as a singular unit. Ten dollars is enough to cover the expense. Watch out for the word “There”. It is usually the first word of a sentence, but this does not make it the subject. There has been traffic on the bridge. You probably already know that there is actually an adverb. In the sentence above, the verb is has been; the subject (what has been?) is traffic. So being a singular subject, it requires a singular verb (has been). A refrigerator is in the kitchen. There are two theories relevant to this argument. Two theories are relevant to this argument. Reversing an inverted sentence (at least mentally) can help us decide whether the verb needs an s–ending. In any case, note that: When a sentence begins with “there”, the subject usually comes after the verb. You may need to look or think ahead when deciding whether or not the verb needs an s–ending. This study “Subject-Verb Agreement” continues. See page two!